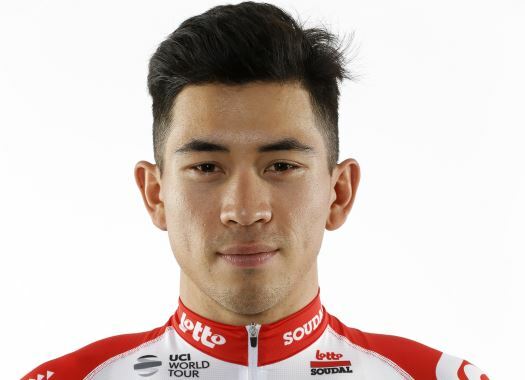 Caleb Ewan (Lotto Soudal) has taken the second place on the podium of the Cadel Evans Great Ocean Road Race. The Australian crossed the finish line just behind Elia Viviani and ahead of Dary Impey. This is the first time Ewan finished the race, after starting but not finishing in 2015 and 2016. The rider wanted to get his first victory in the WorldTour calendar with his new team, but Viviani's performance got in the way of that objective. Ewan managed to survive the high pace set by other teams on the climbs of the day and arrived with the bunch to the final kilometre, but at the final metres he got a little boxed by Mitchelton-Scott's Daryl Impey and couldn't take the victory. "It was very hectic every time we approached the climb as the fight for positions was fierce," the Australian commented. "But the boys did a great job today. The last two laps were really hard but when I got over the second last climb, I realised that I had a good chance of sprinting for the victory because a lot of sprinters had some teammates left to bring back possible attacks. "It was pretty close in the end. I was in a good position leading up to the sprint. I have to thank my teammates for getting me there at the end. I got boxed in a little by Impey and by the time I could get around him, I realised, against a fast guy like Viviani, that it would be hard to still get the win. If I could have started earlier, I maybe could have won. I will now have a little break and then prepare for the UAE Tour."